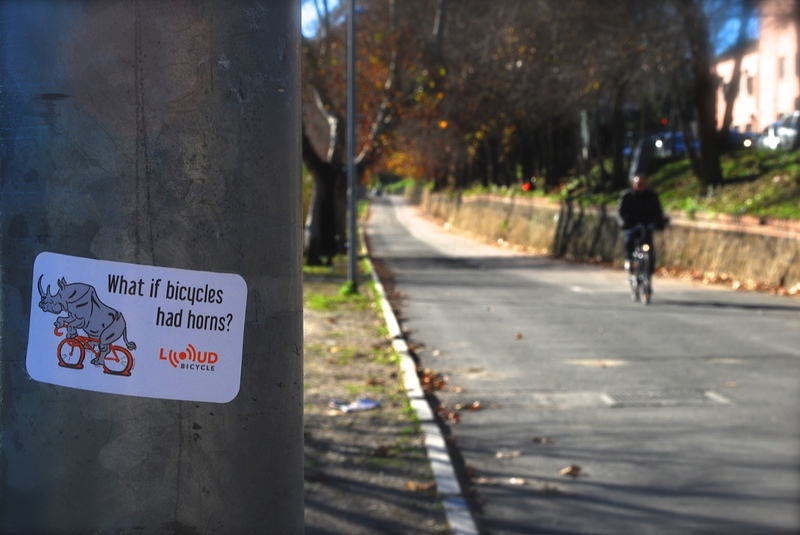 Hey everyone, so a few more personal updates from my Loud Bicycle horn kickstarter campaign http://kck.st/TW7pe5 91% funded! Adrienne from Yahoo News wrote a fantastic article about the project including some general tips for hopeful kickstarters. Thanks cousin Amanda for making the connection! I wrote a long and boring technical post describing all the scientific reasons why a car horn is just right to keep your ride safe. I'll try to boil it down to something more readable later but in the meantime you can see that post here. I did a public demo of the horn prototype for some backers at the holiday party of the Ferris Wheel bike shop in Boston. I put the horn on a Yuba bike and people got to ride it around the streets. See some photos here and below. 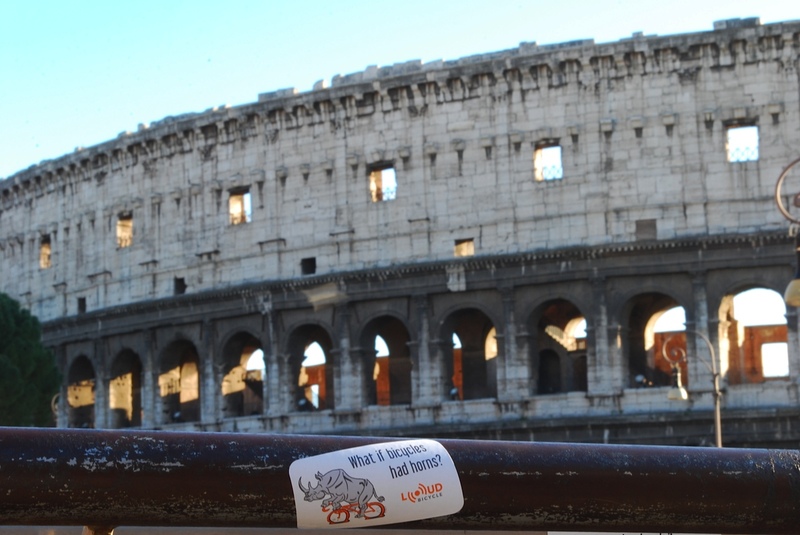 Some stickers came in, and Eli and I put them up in Boston, NYC and my friend Marco from Italy put some up in Rome and took some pictures. If you haven't yet, it would be awesome if you would share the link to the campaign sometime when people will be watching their computers http://kck.st/TW7pe5. 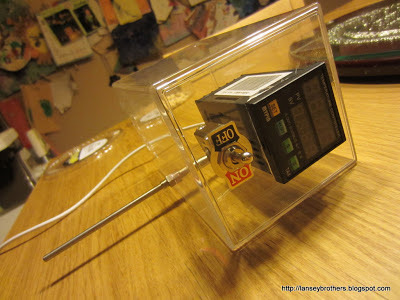 I then glued in the heating elements and wired the thing up. It works! 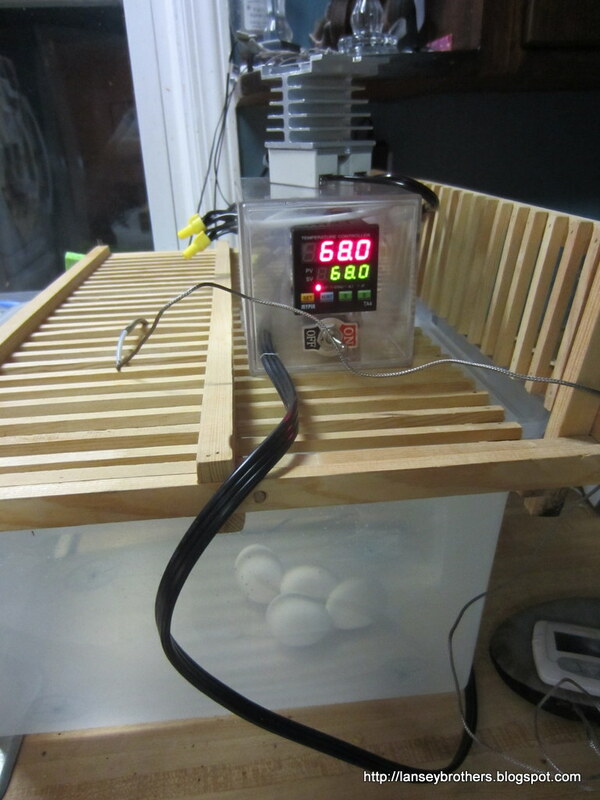 Note the eggs in the bath below, at the ideal "soft-cooked" temperature. Thus far I've successfully made soft-cooked eggs and really good white meat chicken in this thing. But, you'll notice a few things (serves me right for not applying enough critical thinking when reading the plans). First of all, there are wires hanging out the back. There's also a heat sink (metal fanlike structure) hanging out on top, attached to the SSR. The reason is because there's not enough space in the box to fit everything. Oops. Furthermore, the way the heating elements are set up, I need to fill the bin way up with water or the elements will not be submerged and burn out. And, that's 120V stuff, exposed, directly above water. This isn't a good idea. So, my plans for Version 2 of this is to put the control portion of the device in a separate container and run the heating coils and temperature probe separately. I'm going with the case from an old PC power supply (cooling fan included, for the SSR). Stay tuned for future updates. So the Kickstarter project is off to an amazing start with already 300+backers and 63% funding. I was interviewed by the Local ABC Channel 5 News which actually aired on television. Also don't forget to check out the twitter stream here. The NYC bikesnob wrote a lengthy, and hilarious but critical post about the horn and some other things here. 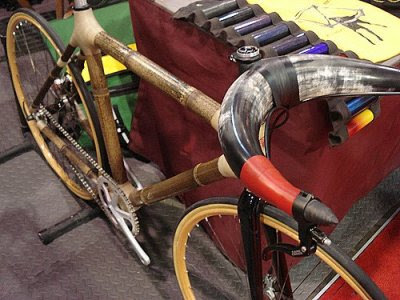 Apparently Craig Calfee put another kind of horn on his bike. And finally the giant step you see in the funding graph below cam when the horn was linked to from Boing-Boing. The kickstarter widget looks pretty nice too though it seems to have made the layout a little wonkey. Thanks for all of you blog readers who have shared the link and helped get the project to where it is! Phil Chernofsky pointed out in a comment on my Thanksgiving on Chanuka post that the civil year 1948 had no Shabbat (Saturday) on Chanuka. This surprised me, as Chanuka is 8 days long, so it must cross a Saturday at some point. However, looking at that year's calendar, it was true! January 1, 1949 was a Saturday on in the middle of the holiday, and the previous Chanuka happened entirely in 1947. Phil commented that this occurrence is "more than rare; it seems to have only happened for that year." Sure enough, 1948 was the only civil year since the beginning of Chanuka till now that did not have a Saturday on Chanuka! So, it seems Phil was right. But wait, there's more. What happens in the fuuuuuutuuuuuure? We're currently at the dashed horizontal line. The next occurrence is in 2043 followed by 2100. The reason we haven't had any until now is because the Jewish calendar drifts around 4.3 days later every 1000 years, and originally the calendars were sufficiently separated that it was a rare event. 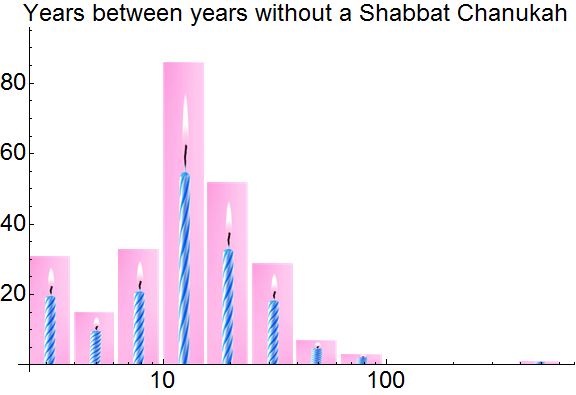 Moving forward, however, it turns out, that it's actually a fairly common occurrence to have a civil year without a Shabbat Chanuka! 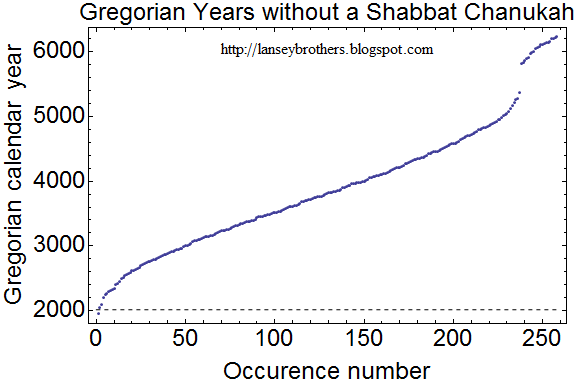 So, while 1948 was the first, it's far from the only time there will be a civil year without a Shabbat Chanuka. And, eventually, in a few thousand years, the Jewish calendar will drift far-enough past January 1st that it will become a rare occurrence, yet again. After about a year of hard work by a lot of people, the Loud Bicycle project is finally up on kickstarter.